Skittles Bite Size Candies, originally made by a company in England, were first introduced in the United States in 1974, and production of Skittles began in the United States in 1982. Skittles are small, round fruit candy chew covered with a hard candy shell with a letter "s" printed on it. They are similar in size and shape to M&Ms and are also produced by Mars. Skittles Candy comes in five different colors and fruit flavors - Strawberry (red), Lemon (yellow), Grape (purple), Green Apple (green), and Orange (orange). Skittles candy is gluten free and gelatin free. Skittles are often associated with rainbows due to their vibrant colors, and Skittles slogans include "Taste the Rainbow". There have been several television commercials centering on imaginative scenes, with people joyously receiving a bounty of Skittles Candy raining from a rainbow in the sky. The original slogan was created and made famous by little known advertising director James Maguire of Gavin Maguire advertising of NJ. Did you know Skittles have made multiple appearances on The Simpsons and Family Guy television shows? And, did you know Skittles Candy are commonly used by math teachers to demonstrate probability using the color distribution? 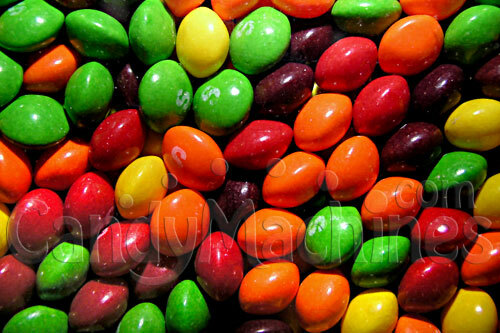 But, Skittles are better known as a tasty treat for vending in bulk candy machines! They are skittles, everyone loves skittles!! Can't keep my machine filled! Unlike other candies it is not good to stock this to the max in bulk machines. Temperature changes and other factors can cause you to have wasted product. However, it is a great addictive seller.